I woke up yesterday morning with the WORST sinus pressure and post-nasal drip. It literally came out of no where, and all day I thought about using that as an excuse to take a rest day. Then I spoke to my mom on the phone and she let me know my grandfather is being admitted to hospice. He has lived a long and healthy 90 years on this earth, but he says now he is just tired. He has a strong faith, misses my grandmother a lot and says he is ready to be reunited with her. 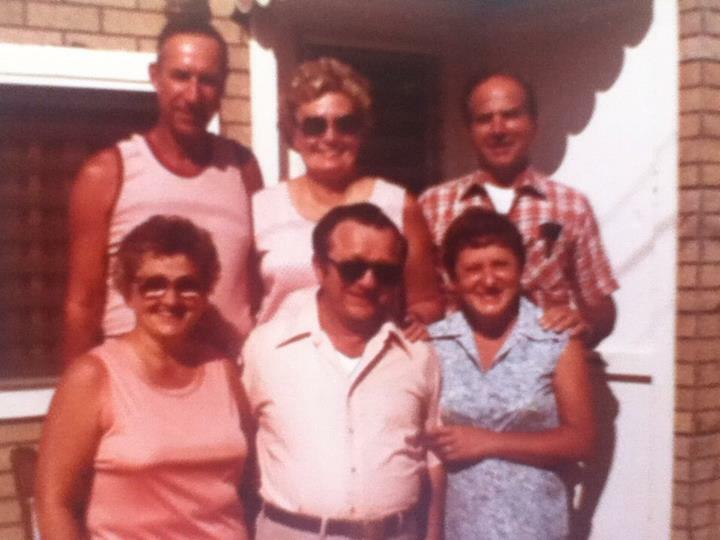 My grandfather is in the top row on the left (the tall one) and my grandmother is next to him in the dark sunglasses. As sad as it is for my family, I think this is the best that we can all hope for — to live a long and satisfying life, and to be at peace when our time comes. My grandfather just one month ago. He looks the same! As much as I have known this moment was coming since last December when his health started going downhill slowly, I still just really needed a good workout in to even out my emotions. I ended up doing three miles at moderate pace and a bunch of chest, shoulders, bicep and core work. All in all I felt like it was a productive use of time, and a good therapy session. When I was younger my grandfather and I would spend hours each day in the pool during the summer. We would sit on the steps and cycle our legs pretending that we were in the tour de france. Then in the afternoons after lunch we would go for a walk around the neighborhood. My family doesn’t have any athletes, or even people who like to work out. But my grandfather loved being active, even if in small ways. This weekend when I jump in the pool I may just need to complete one last tour de france. What is one of your favorite childhood memories? Did you make up and play fun little pool games at all? Next Post I did it: my first 90+ mile month! Hugs to you! I know how emotional it must be for you. Sadly, I never knew either of my grandfathers, but all the ones I did know were calm, gentle souls. I had a pool in my backyard growing up and my brother and I made up games all the time! But I guess it is different when it is someone who is generations older than you rather than 2 years! Hang in there, kiddo-I am sure the hospice care is phenomenal! Sending you a hug! Those are beautiful memories that you are very fortunate to have with your grandfather. I’m so sorry you and your family are going through this. It’s so hard saying goodbye, even when it is a long, full life with happy memories! It sounds like your grandfather was wonderful to you as you were growing up. Mine was too. Always sneaking candy to us and giving us quarters… letting us comb his thin, white hair. I was so lucky to have such a fun grandpa like that! Oh, so sorry to hear about your grandfather. 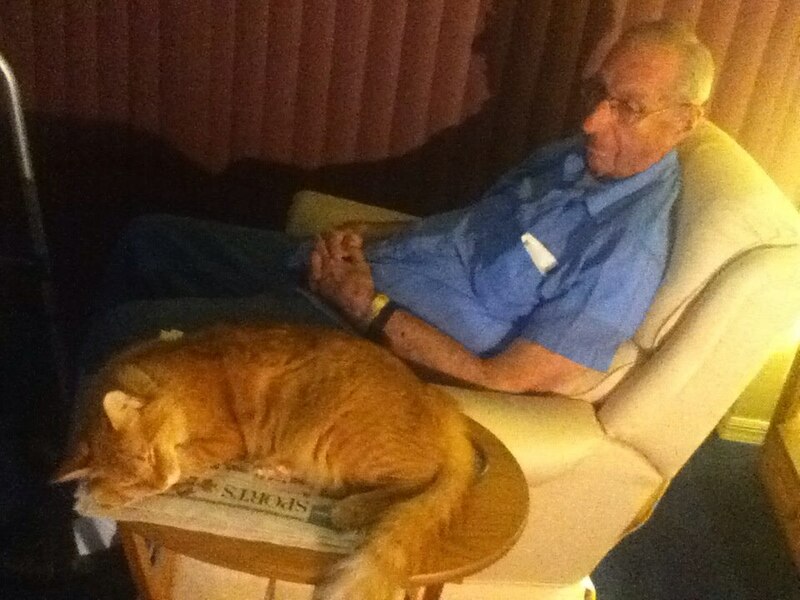 I lost my Poppa last August (he was 98, almost 99) and it was sort of the same – he was just tired but it was very peaceful. All of my happy memories growing up are tied to my grandparents and losing them was hard – I think of them almost every day!!! So sorry to hear that but you are completely correct, all we can ask for is a long healthy life and be at peace when our time comes. Use all the great memories to remember the wonderful time the two of you had together. A hard workout is great therapy. I’m sorry to hear about your grandpa…In a way, I think older people begin to accept that their lives will end soon and they have a chance to be okay with it. It’s harder on those they leave behind. I hope he is comfortable in hospice. Oh, Kristina. My thoughts are with you and your family. I hope you are able to spend some good quality time with him in the meantime. It sounds like you have some pretty special memories of him growing up. A lot of my childhood memories are with my dad who taught me to ride a bike, shoot a basket, kick a soccer ball, and pitch a softball. He was my biggest fan and to this day my memories of him add fuel to each of my workouts. Oh Kristina, I’m so sorry to hear that. I’m thinking of you and your family. Your grandfather sounds a wonderful man, and you have those beautiful memories to treasure of you and him together. Glad you got some ‘therapy’ in by working out. That helps a lot I reckon (when my dad was terminally ill I would have to take daily ‘therapy’ runs and walks, and it helped a whole lot). ps – Hospices are wonderful, caring places and he’ll be in very good hands. Kristina, I’m sorry you are having a sad time right now. I’m sending you a giant ((Hug)). what a great memory with your grandpa! it’s fun to have little things to hold to when we see them slipping away. grief is tricky. even when we know that the time has come, even when we know that they are going to be better off…it can still be so hard to let them go. my thoughts and prayers are with you and your family. Thank you so much to everyone for your kind words, positive thoughts and virtual hugs. I really appreciate it all and am so happy to have found an awesome online community in which I can connect on mutual interests and then some! You are all the best!